Quilts often give us a chance to travel back in time. Imagine wrapping a quilt made by your mother, grandmother, aunt, or even great-grandmother. My friend and fellow author, Deborah has a quilt made by her mother-in-law, just for Deborah. The quilt is across the bottom of her bed, for looks. However, on bad days, or when Deborah is ill she wants that quilt to wrap around her. It gives her the feeling of having her mother-in-law’s arms wrap around her. A feeling she enjoys since her mother-in-law died several years ago. We don’t have to wrap a quilt around us to visit the past and feel the emotions of those long ago quilters. We can visit quilt museums. No, we can’t wrap up in those quilts, but just seeing them touches our hearts. On my list of quilty places to visit is the Rocky Mountain Quilt Museum in Golden Colorado. As a bonus, until the end of April that museum has a special exhibit by male (another “m” word) quilters. While I won’t make it to the Colorado museum this month, it is on my list of places to see. Quilt museums are like a permanent quilt show, giving guests the opportunity to see a variety of quilts over a longer period of time. The museums also offer visitors a chance to see special displays, such as the round-up of men’s quilts available at the Rocky Mountain Quilt museum. You don’t have to go to a quilt museum though. Other museums often offer a peek into the past with quilt displays. The quilt show above was made in 1850 and is on display in a museum in Dodge City Kansas. Do you have a quilt museum in your state? Have you ever visited a quilt museum? Do you own a quilt made by a relative, or loved one no longer with us? 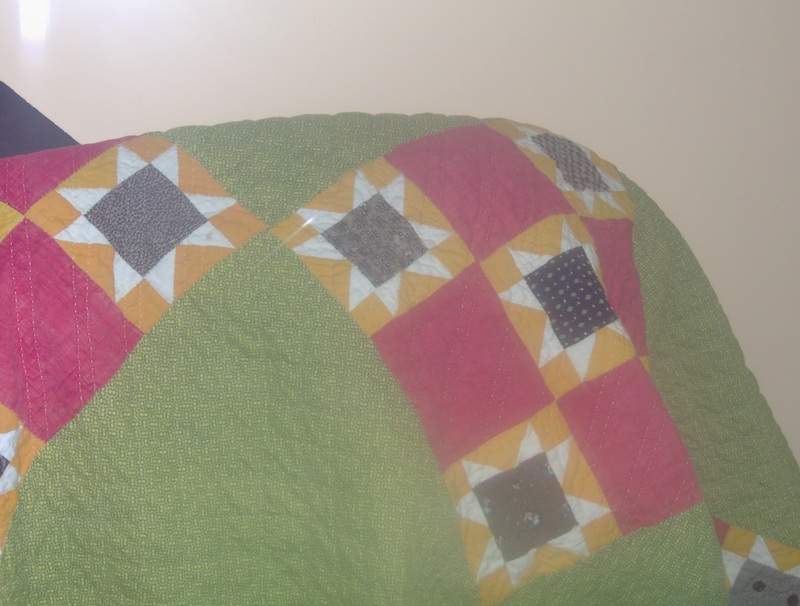 The complete story of Deborah’s quilt is in Devoted to Quilting 2. Join us on Facebook at, A Patchwork Life. Joining the fun bloggers at the A to Z challenge. Check them out for more great blogs. This entry was posted in A to Z and tagged antique quilts, Blog, bloggers, devoted to quilting, family, friends, Golden Colorado, history, Home, male quilters, quilt museum, Quilt museums, quilts, Rocky Mountain Quilt Museum, sewing, travel, vacation on April 15, 2014 by Nita. 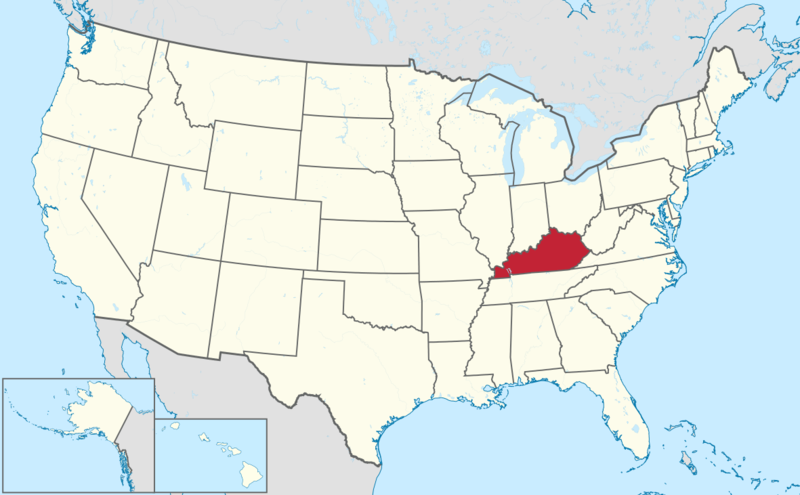 What do you think of when you hear “Kentucky”, that little patch of red over toward the eastern border of the United States? But for quilters, it is the home of the Paducah Quilt show. An event most of us have on our wish list. From all reports it is a fantastic time. Not only is there the event itself, but the town gets into the stitch of things. Visiting Paducah Kentucky, will take a few dollars. The trip to and from won’t be too expensive but I can’t imagine going those miles, to such a great event and not spending money. I’d probably have to save my “getting home” money in a special spot, or I’ll spend it too. Have you ever been to the Paducah Kentucky show? What quilt show is on your “have to visit” list? April is the month for the A to Z challenge. Check them out, there are hundreds of bloggers, you’e sure to find some one new to follow or visit. This entry was posted in A to Z and tagged Blog, bloggers, bluegrass music, devoted to quilting, friends, Kentucky, Kentucky derby, Paducah Kentucky, people, photos, quilt, quilt show, quilters, transportation, travel, vacation on April 13, 2014 by Nita. The wonderful bloggers over at the A to Z challenge are responsible for today’s post about the letter J.
Johnny Cash and June Carter Cash weren’t talking about Jackson Wyoming when they sang the song, “Jackson.” At least I don’t thing so. If they were, they sure weren’t singing about the quilts available there. However, for the J portion of my quilty travels, Jackson Hole Wyoming and the quilt festival is where I hope to be headed in October. Lake in the hills of Colorado. Natalia Bonner, author and free-motion quilter. Oh yeah, I hope to learn something from her. My free motion quilting is questionable to say the least. Barbara Olson, fiber artist. Check out her work on her website. While I’m not an artistic quilter, she may change my mind. Charlotte Warr-Anderson, quiltist. Her word. She is known for her portraits in fabric in which she uses intricate applique. She has also been featured on been The Quilt Show. Carole Liebzeit is a local quilter and will be sharing her varied talents with those attending the festival. Susan Garrity designs floral, abstract, wildlife, and landscape art quilt often using fabric she dyed. When I’m all filled up with gorgeous quilts and my brain is stuffed with new lessons another stop in Colorado to visit with a few of my grandsons will top off the trip. Have you ever taken a class at a quilt show? What would be your dream location to attend a quilt show? Have you ever combined a quilt show visit with another fun activity? This entry was posted in A to Z and tagged A to Z, Blog, devoted to quilting, family, friends, photos, quilt, quilt show, quilter, transportation, travel, vacation on April 11, 2014 by Nita. 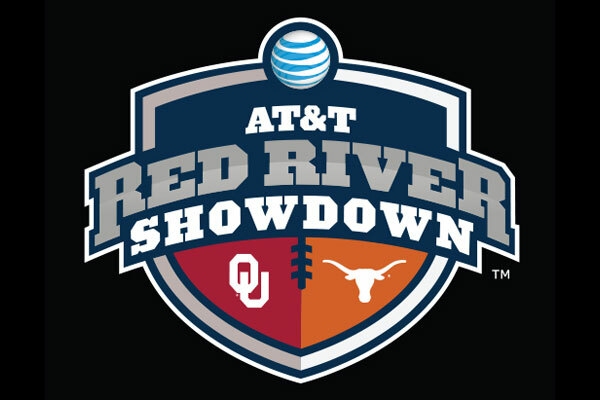 No rivalry between Texas and Oklahoma in the Quilt stores, especially in April. No, in April (April 24-May 3) we have the HOP THE RIVER SHOP HOP. An extravaganza of quilt store shopping that couldn’t be contained in one state. The Hop includes five stores in Oklahoma and four in that state below the river (Texas). A complete list of the stores involved in the hop can be found at The Quilt n Bee. Hopping from store to store, especially with friends is a great way to spend the day, weekend, or week. Stores offer prizes and have gifts for their customers during hops. However, the best thing about a hop is seeing different quilts, almost like a quilt show on the road. Instead of the quilts traveling, the visitors are. Each store has different fabrics and tools. Sharing, learning, visiting, and fabrics. This will be my first time to Hop the River and I’m looking forward to the adventure. Have you ever participated in a shop Hop? How often do you visit new stores? How many stores would be your limit to visit in a day? Please leave a comment, I love hearing from you. This post using the letter H was brought to you by the friendly folks at the A to Z challenge. Over 2,000 bloggers are participating. This entry was posted in A to Z and tagged bloggers, devoted to quilting, friends, hop the river, quilt show, quilt store, quilt stores, quilters, quilting, sewing, shop hop, Texas and Oklahoma, transportation, travel, vacation on April 9, 2014 by Nita. Gardens are beautiful (especially if I don’t have to do the work). Flower gardens, those with beautiful blooms are preferrable to the all green of some gardens. Maybe it’s the quilter in me that loves all the color, I don’t know. I do know that on my list of places to visit is Indiana to take a quilt garden tour. Just imagine. Wondering around a flower garden inhaling the intoxicating scents of the different plants. Enjoying the riot of color as the patch of one color and flower met with the patch of another. Why, it might even spark a different color combination idea, or plant the seed for a quilt design. Enjoying time in the garden is always a pleasure and I’m looking forward to the day I can enjoy both quilts and gardens at the same time in a quilt garden. Have you ever visited a quilt garden? Have you ever considered trying to plant a quilt garden? If you were doing a mini-quilt garden which quilt blocks would you try to replicate? Today is for the seventh letter of the alphabet (G) in the A to Z challenge. Due to some family challenges I am a few letters behind. Stay tuned, I will catch up. This entry was posted in A to Z, Photos, quilt and tagged Blog, bloggers, devoted to quilting, friends, nature, outdoors, photos, pictures, quilt, travel, vacation on April 8, 2014 by Nita.